I’m always on the lookout for a good Chinese cookbook, and I tend to make tiny mental notes when my cooking friends rave about the same book. 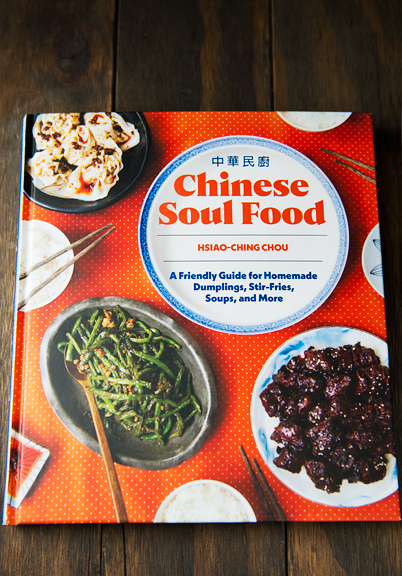 Last month, I got an email asking if I wanted a review copy of Chinese Soul Food by Hsiao-Ching Chou. I usually decline book reviews – it’s not worth my time unless it is something I am personally interested in checking out – but recalled a couple of pals had sung its praises. The good news is that the book is full of accessible and delicious home-style Chinese recipes and good information on ingredients, equipment, and techniques that are commonly utilized in Chinese cooking. The bad news (for me) is that I’ve already made and blogged some version of most of the recipes in the book. Happily, I was able to find a handful of recipes that I haven’t blogged before, and settled on a noodle dish. I will choose noodles over rice any day, but this stir-fried noodles with beef uses fresh rice noodles. A delightful compromise. 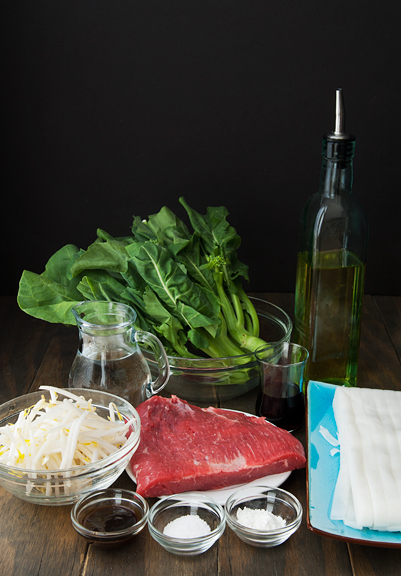 In her notes, Chou says if you cannot find gai lan, you can substitute other leafy greens including Chinese broccoli. Gai lan IS Chinese broccoli, so I think that may have been an editorial oversight. 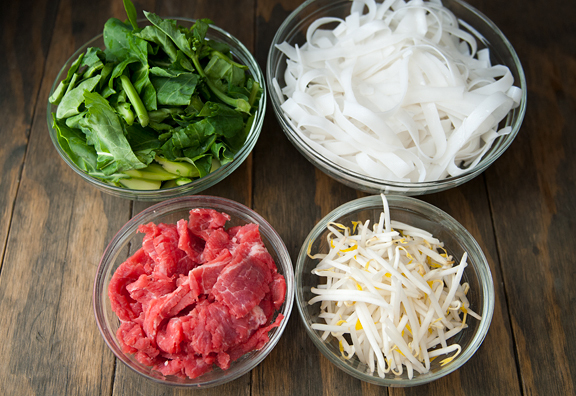 It’s true that you can use other leafy greens, but gai lan has great flavor and texture that pairs well with the chewy, delicate rice noodles. I increased the amounts of greens and sprouts and omitted the carrots because they do absolutely nothing for me. When the rice noodles are cold (they are usually refrigerated at my market), they are quite brittle. Allow them to come to room temperature or gently warm them in the microwave so they are pliable and easily separated. 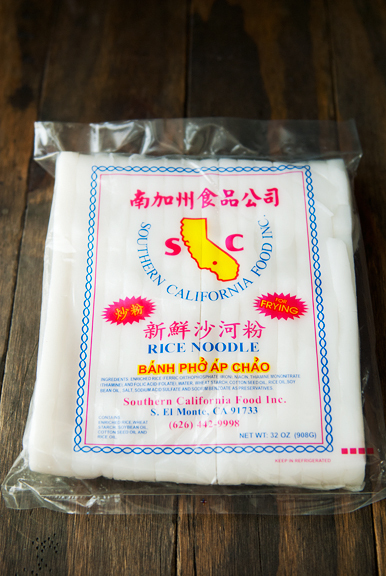 If you try to cook the noodles unseparated, you will have a giant blob of rice noodles with an uncooked center. 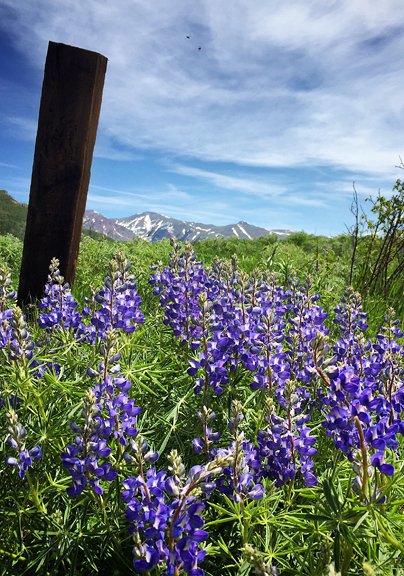 After we drove the car home from the dealer, we loaded up the other car and headed back to Crested Butte just in time for the start of the wildflowers and my enthusiastic allergies. 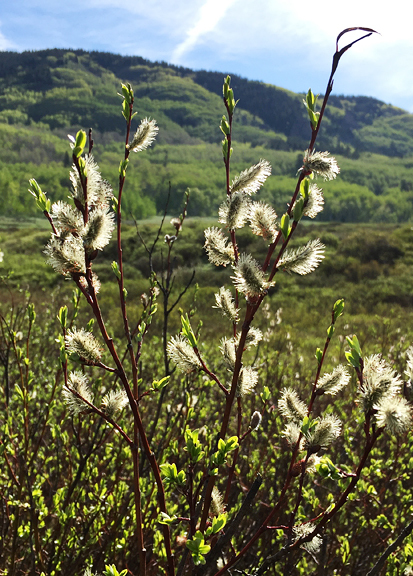 The early flowers are popping up on the hillsides and in the forests, and with them come butterflies, hummingbirds, and happy bees. 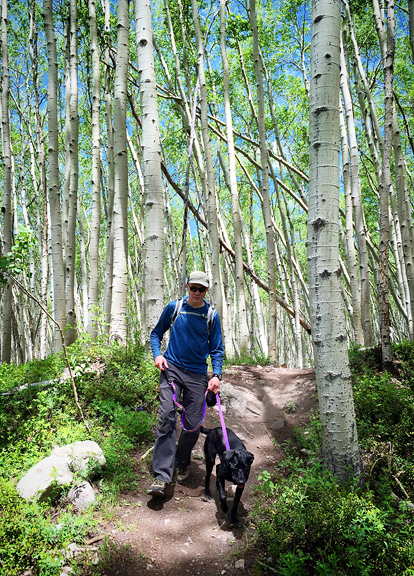 I love summer when she is new, but I know from experience that come August, I will tire of this mistress and my daydreams will linger on winter powder days and spring backcountry skiing. My god, the back of my neck is tingling just thinking about ski season. 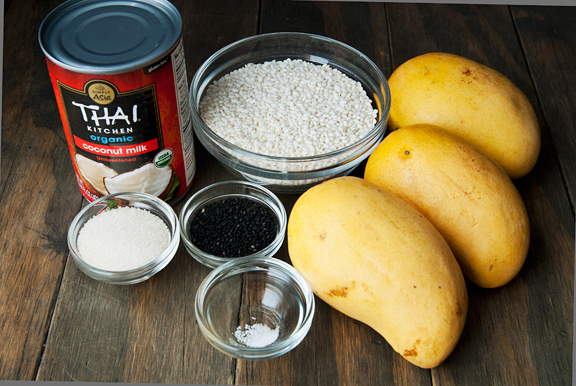 Today’s recipe is an easy one with a handful of ingredients – Thai sticky rice and mango. It’s gluten-free, dairy-free, not too sweet, tropical, and delightful. 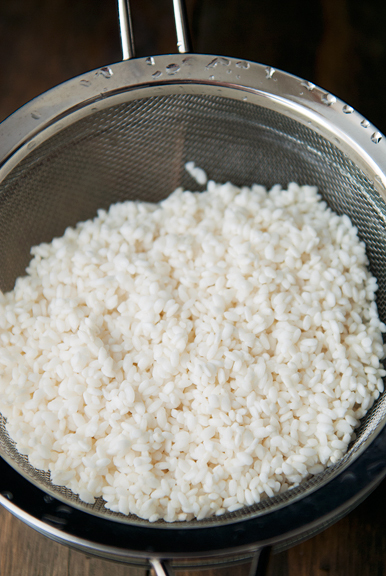 If you have a rice cooker, it’s EVEN easier! 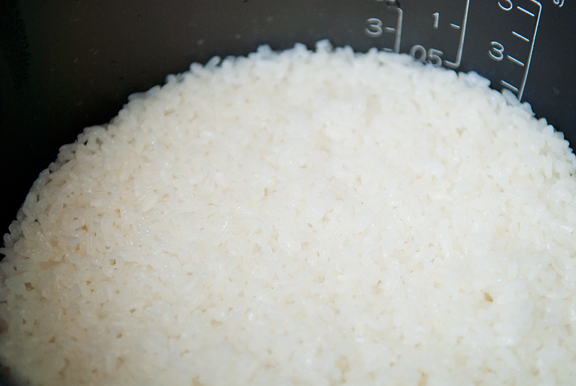 But without a rice cooker, you merely need a way to steam the sweet rice, which is glutinous sweet rice… which does not contain gluten, but is sticky as hell. Awesome. 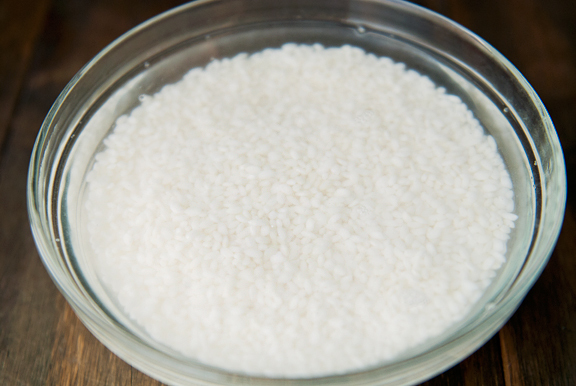 First, soak the rice in cold water for several hours, then drain and rinse until the water runs clear. 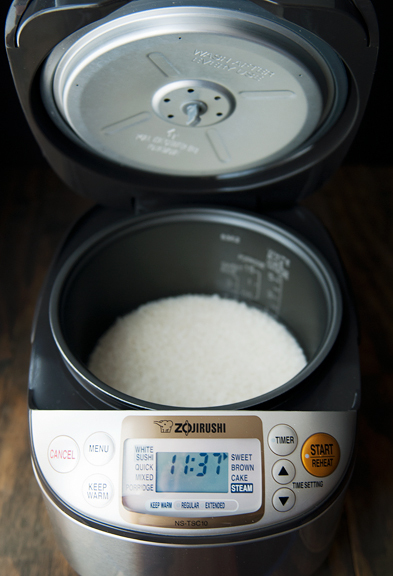 My Zojirushi rice cooker has a “sweet rice” setting, but you can also steam the rice until it is tender to the bite. 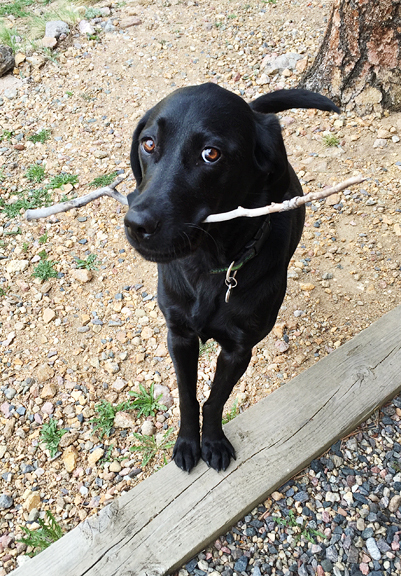 And sticky. When I hear a weather forecast on the radio for “a beautiful day”, I already know they mean sunshine and warm temperatures, because our society has got something against rain and snow and cold. But I have lots of good reasons for loving precipitation! 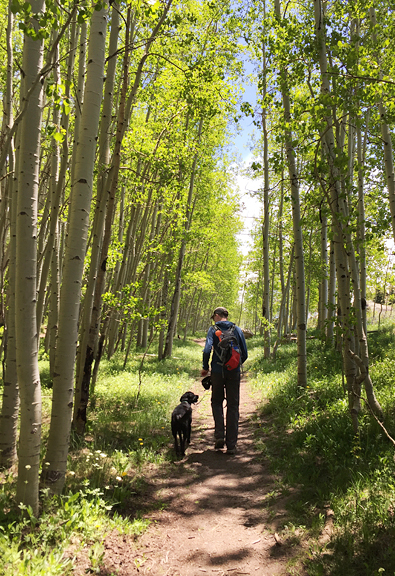 The most obvious is the skiing, but recreation aside, our snow pack and rainstorms provide much-needed insurance against out-of-control wildfires in the mountains as well as water for all of the flat-landers downstream. Other bonuses include mushrooms (oh, the mushrooms! 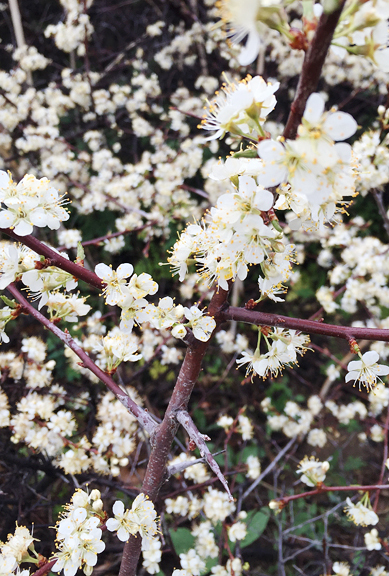 ), wild berries, and wildlife that rely on moisture to survive and thrive. 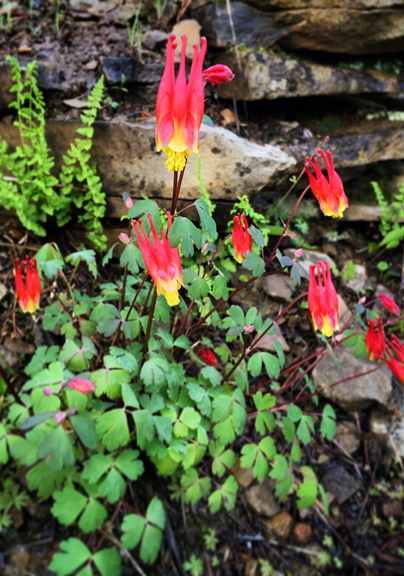 Don’t forget those stunning wildflower displays at the height of summer, or refreshing waterfalls and alpine lakes that are a joy to hike. Besides, rainy days make sunny days all the more delicious. 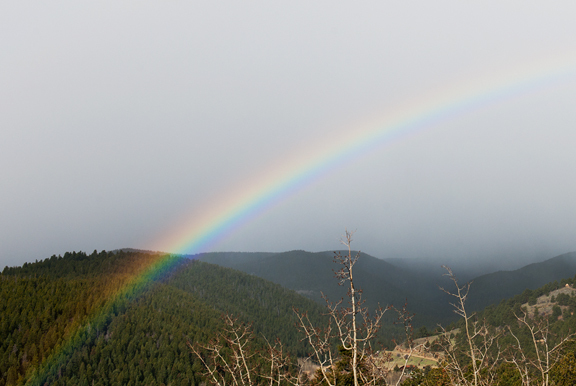 So yes, we are getting some belated April showers, at last! 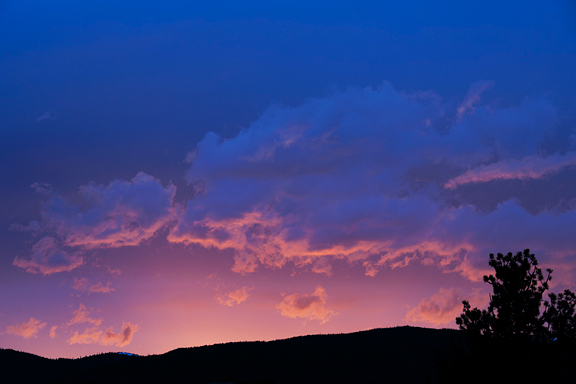 Sometimes it falls as snow, sometimes it falls as rain. At this point, I am happy with either one. Sure, I’d love a few more backcountry ski days, but I’m already four weeks into my trail running season. I could go either way and it’s all good. 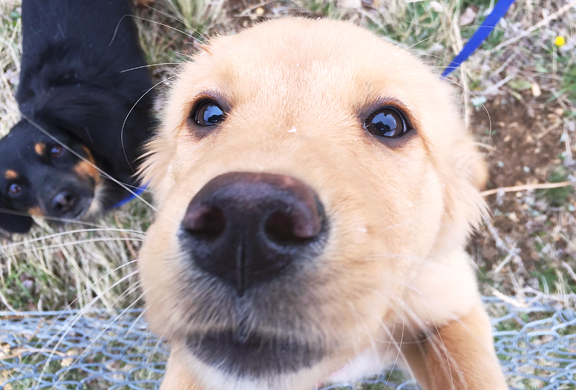 The longer days also mean more time for outdoor puppy play and training! I’ll be honest. My main desire for rain right now is so the mushrooms flush instead of petering out in another drought. Despite hitting the jackpot a couple of times, last summer was a crap season for mushrooms overall in Colorado. It was simply too dry. So you can imagine my delight when it rained for two days last week. 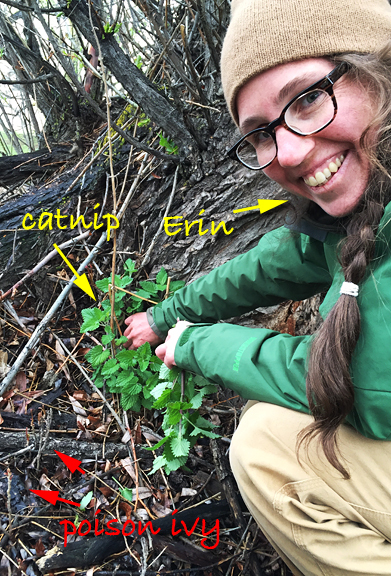 Erin and I met shortly after sunrise to wade through freezing cold streams, carefully picking our way through mazes of branches while spotting and avoiding poison ivy. The conversation meandered from topic to topic, much like our path which wasn’t a path, but a series of points of interest that led us further into the woods and tall grasses. 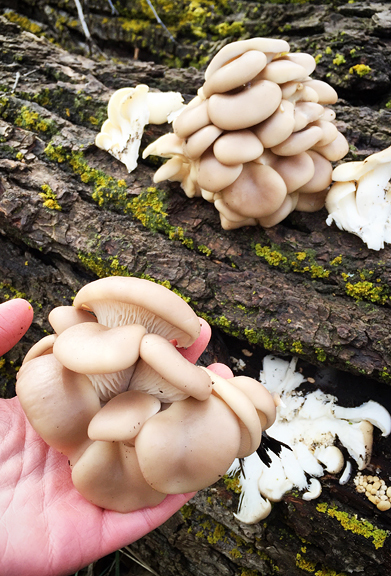 Despite her protests, I made Erin take all of the oyster mushrooms home. 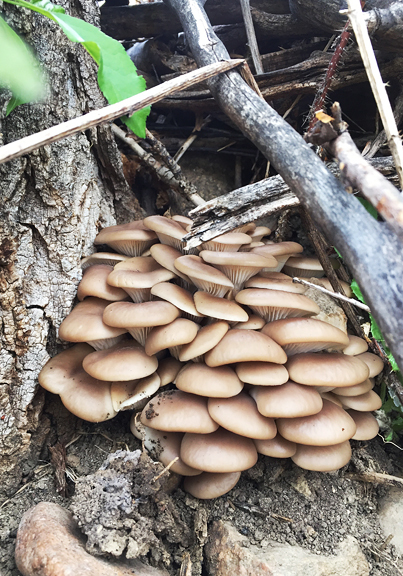 Part of the reason was because I know Jay, her husband (and also my friend), is crazy about wild mushrooms. The other part was because I had accumulated so much psychological freak out over poison ivy contamination with each hour we were foraging that my brain was about to explode. 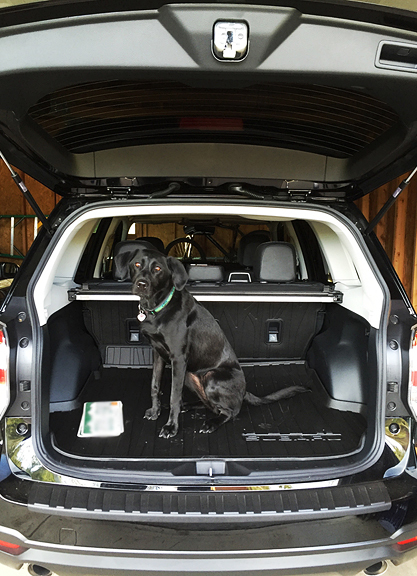 I’m just a little OCD… When we got to the cars, I told her I wanted her to keep the mushrooms as I began shedding my outer layers, turning them inside out, and stuffing them into plastic bags (to take home to wash). I wouldn’t have the time to clean and cook the mushrooms anyway. I had plenty to get done at home like baking a batch of cookies to mail to my dad. Mom had pneumonia for the past couple of weeks and Dad took great care of her, so I felt he deserved a treat. 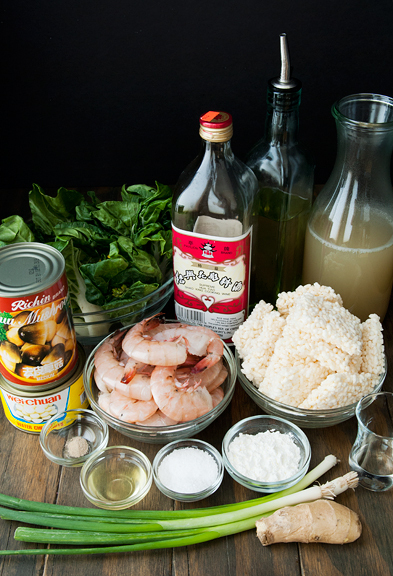 Plus, he gave me this “recipe” for Chinese shrimp and sizzling rice. I put recipe in quotes because it was conveyed to me via phone conversation with a lot of shouting and hand-wavy quantities. A little bit of this. Some of that. Maybe some peas. I don’t want peas. Okay, no peas. I can only imagine if my parents had a food blog. 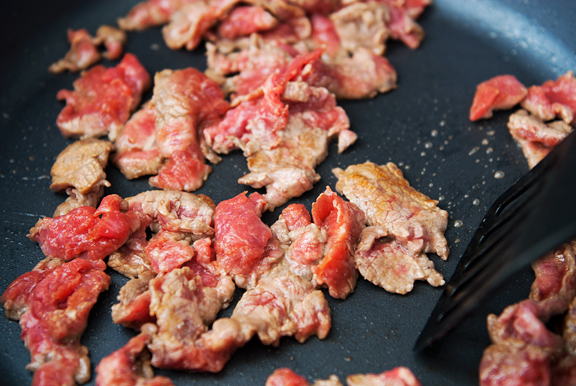 After some research, I did find a couple of recipes for homemade sizzling rice which involve steaming rice, then baking it low and slow, then deep frying it. 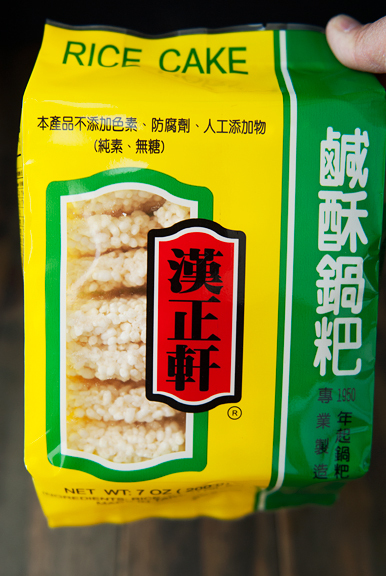 I took the easy way out this time and bought Chinese sizzling rice cakes at an Asian supermarket. I’m showing you the packaging because that is the only way I can find it. It’s usually tucked somewhere among the dried noodles, but one time they moved them and I spent a half hour scouring the aisles before I located the rice cakes. 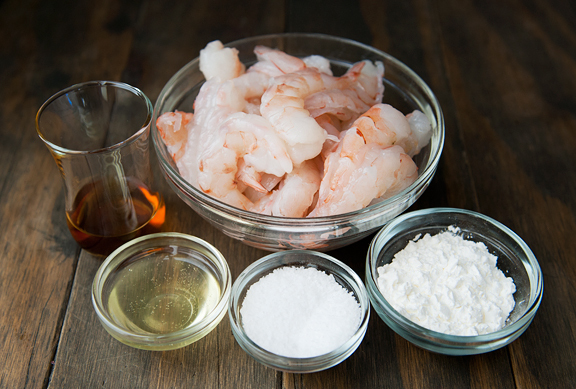 The shrimp should first be mixed with Shaoxing wine, a half teaspoon of salt, and a little bit of egg white. Don’t use too much egg white or else you’ll wind up with a lot of cooked egg in the pan. 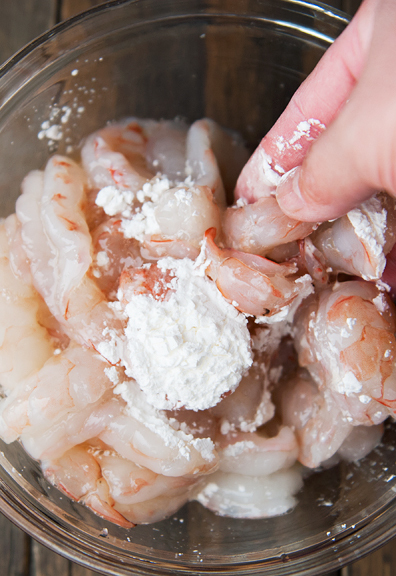 You just want enough to coat the shrimp. 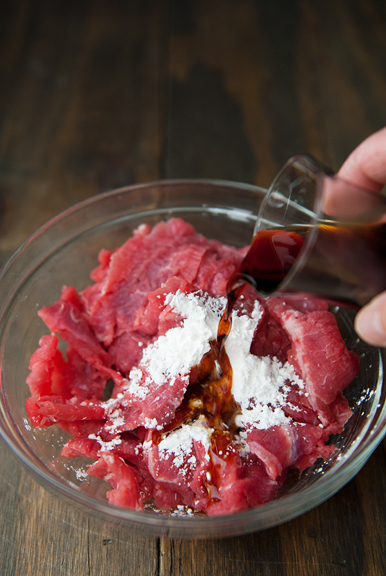 The cornstarch should be mixed in last. 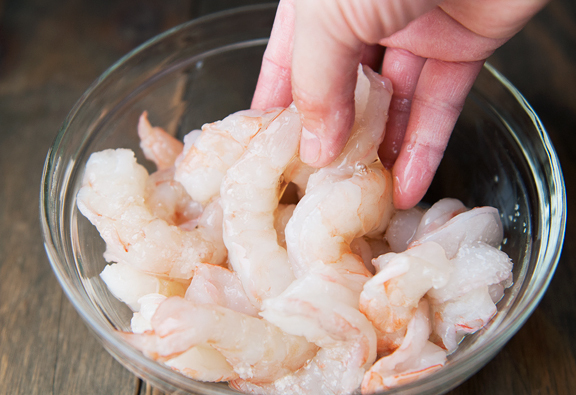 I let the shrimp marinate for ten minutes on the counter, then I pop them in the freezer for another ten or fifteen minutes per my dad’s instructions. 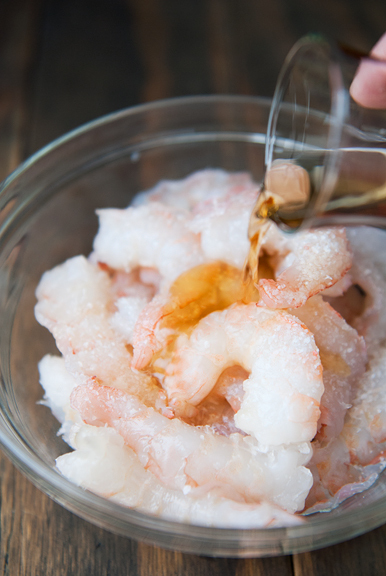 The freezing is just to get the shrimp cold and not to actually freeze them through. This probably keeps the shrimp from overcooking.